So this is where I always get nervous -- I figure I have no right calling a double-whipsaw that accurately (hitting both sides within three-point target ranges) two days in advance. I always assume the market must have something else up its sleeve. It's like when you're going to ask your spouse something they normally wouldn't agree to, so you head in expecting an argument -- but instead of arguing, they cheerfully say, "Okay, hon, sounds great!" You're immediately suspicious. "Why on earth did she agree to that? She must be up to something!" That's exactly how I always feel about the market at times like this. Be that as it may, we should probably stick with the plan until the market proves otherwise. The key level for bulls is yesterday's spike high; as long as bears can hold that level, they're cleared for a solid decline. A bit more backing and filling first would be normal. 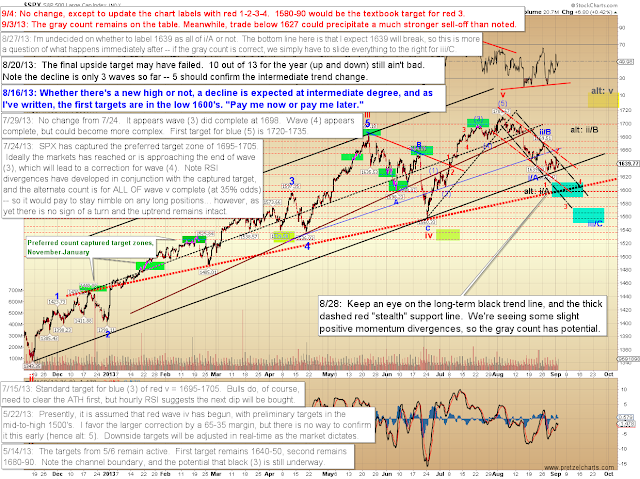 In the event the market's up to something, though, and breaks above that level, I've roughly outlined one alternate count on the chart below. 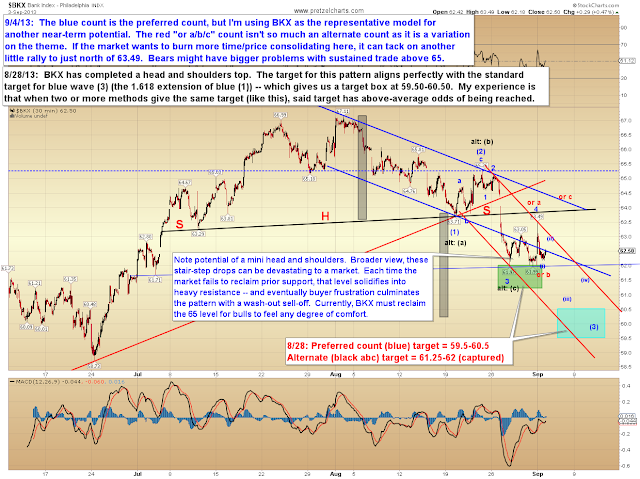 I've used the Philadelphia Bank Index (BKX) to illustrate one way the market could throw a curve-ball here, to shake more bears out and draw more bulls in. Again, unless the market can break yesterday's high, there's no reason to expect these other outcomes -- but we always have to try and see both sides of the trade. 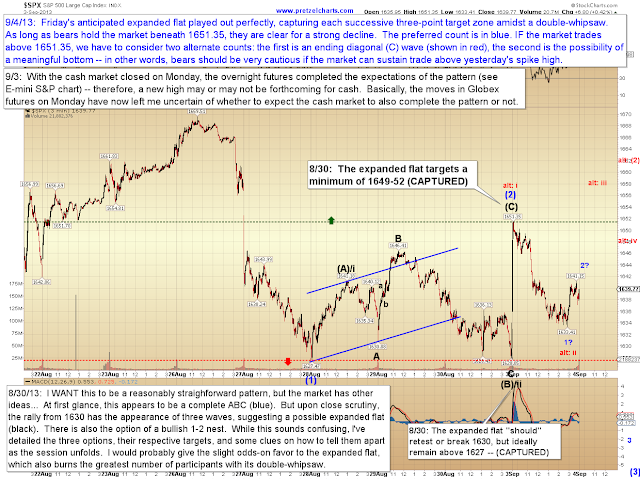 On the hourly chart, I've added the red number labels and noted the standard target for red 3. 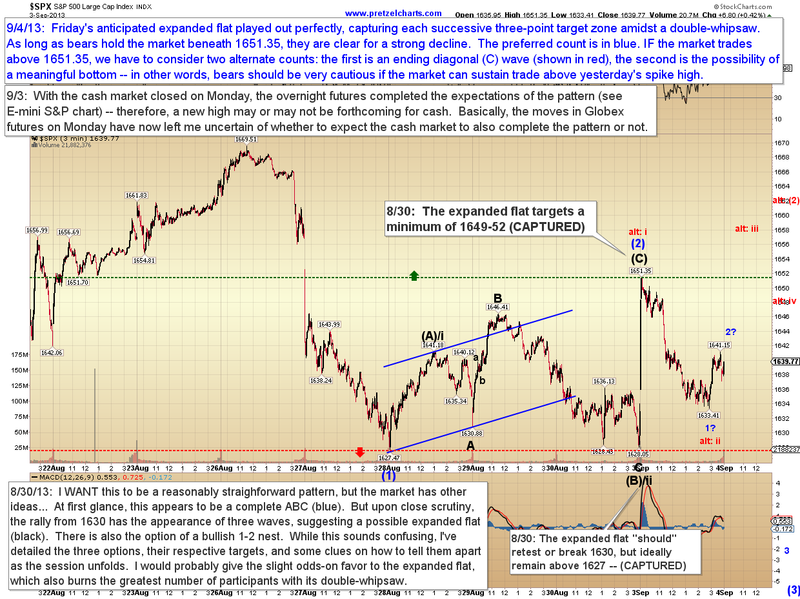 In conclusion, bulls will need to reclaim yesterday's high to have any shot at redemption. 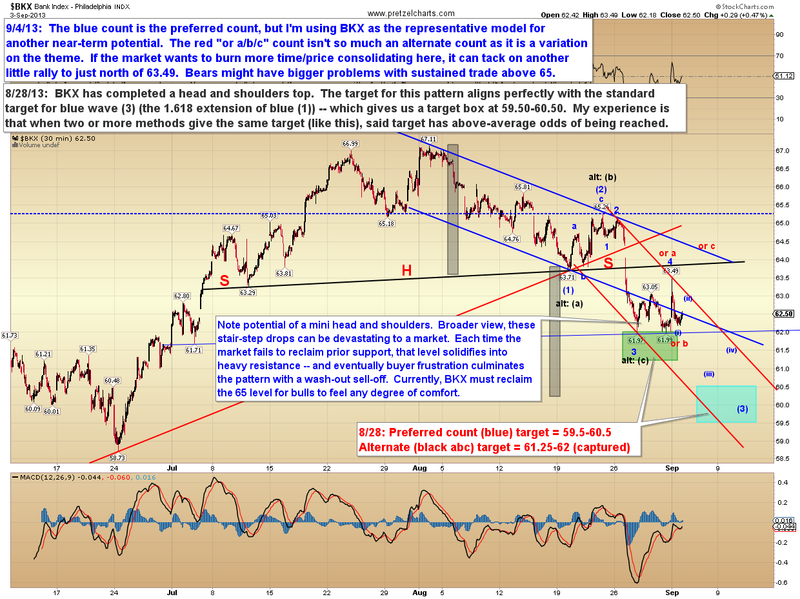 Barring that, the most likely outcome presently appears to be further downside -- and if the count shown is correct, the market is gearing up for a strong trending move. Trade safe. I have seen you call ending diagonal C-waves over and over again with very alarming accuracy.You called one when the market was declining from the 1687 high (I think it turned at 1654). Brilliant. So far so good on this call. Wave 1 is 3 waves and 23.3 points, Wave 3 is 3 waves (jury is still out) and 22.3 points, and wave 4 has already overlapped with 1. How can you tell that wave 3 is done? Sorry for posting here. I'll stop. Just excited about seeing things more clearly. Very patient and focused. Picking points of low risk/high reward.